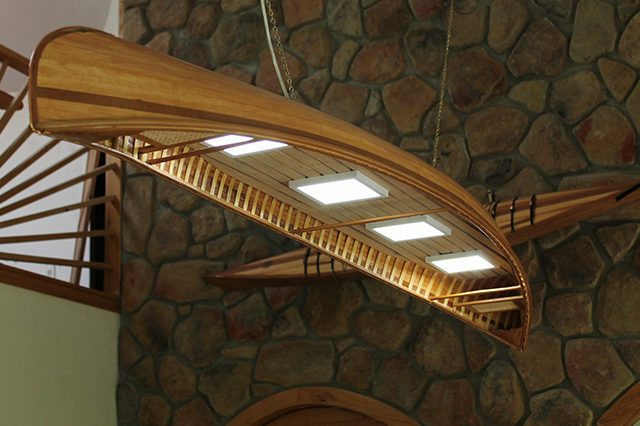 Come on in and browse our Canoe Chandelier show room. 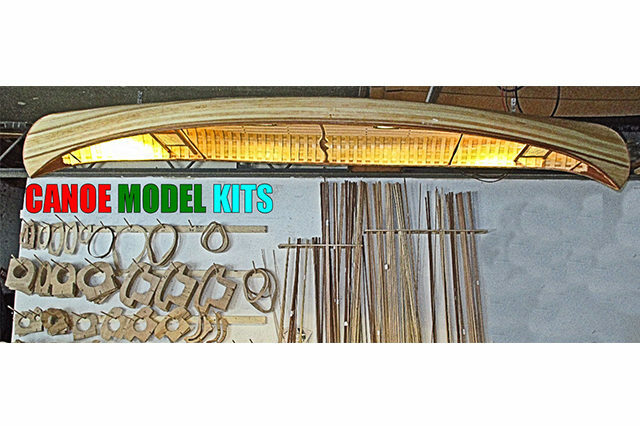 There are many options so please feel free to email me at info@canoemodelkits.com or call Ray, direct at 401-218-8706 , 8 to 7 EST. 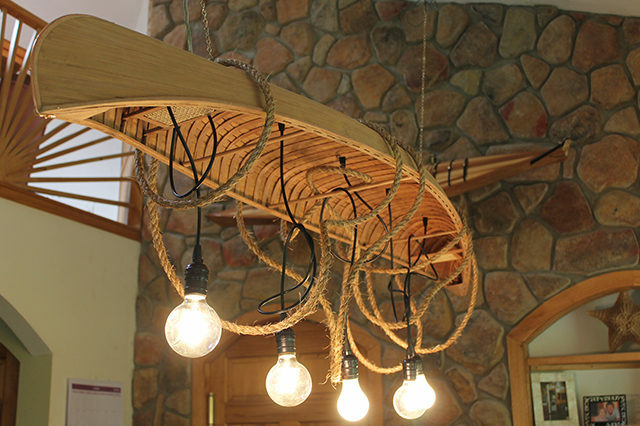 Our “Canoe Chandeliers” are a one of a kind light that is both beautiful to look at and great for lighting up that Great Room, pool table, over your bed or anywhere that shows off your good taste. 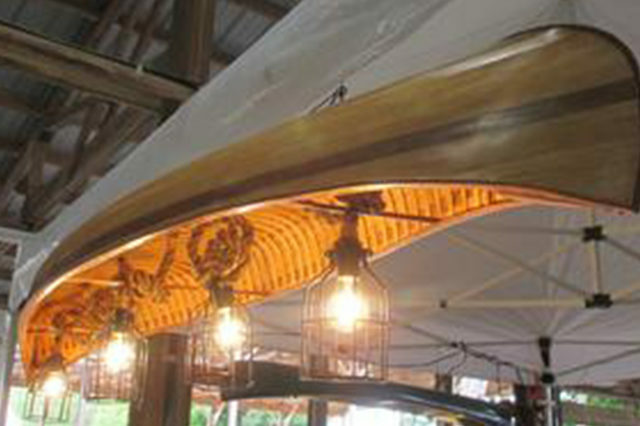 Every canoe is carefully built by a skilled craftsman. Authentic in every detail. 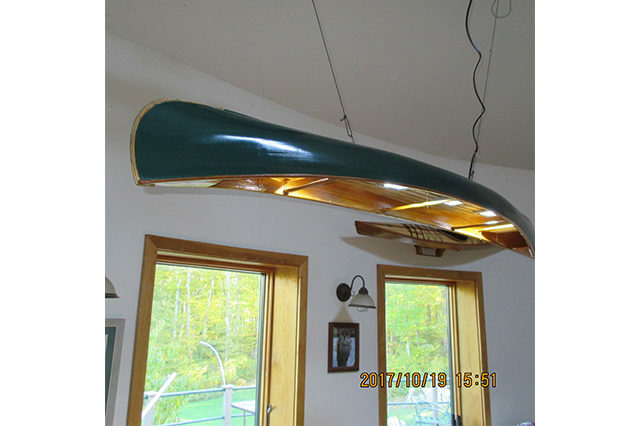 Not only are they a great show and conversation piece for the canoeing enthusiast, but also an excellent source of lighting for that special place in your home or business. Every one is custom made to taylor the customers wishes, all at a very reasonable price. 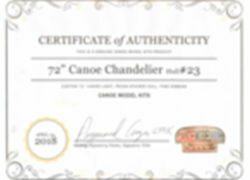 Each canoe has it’s own “Certificate of Authenticity” with an actual hull # engraved in the canoe. There are 3 sizes to choose from. The 96″ is the most impressive of all. 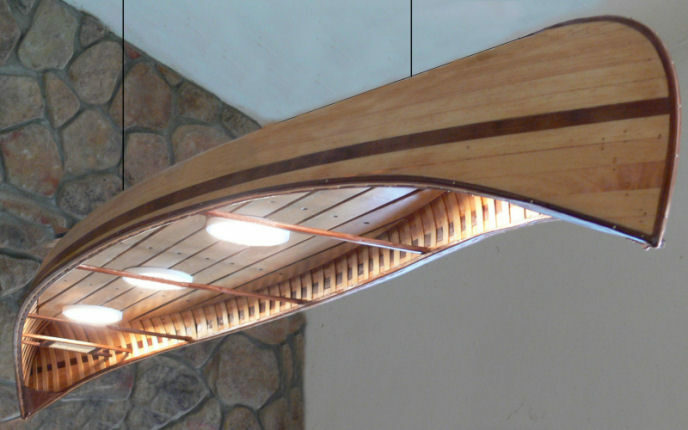 A real canoe built to last for generations. This is a very realistic canoe. Many people ask if they could actually get in it and paddle it, but no you can’t. It is for display only. Built by gluing wood strips over a set of forms. Sanding and trimming till the desired canoe takes shape. Then it is stained. A layer of 3 oz cloth and multiple coats of epoxy are applied to ensure it will last through years of tough conditions that could be found in a seasonal camp or lake cabin. Finally it is finished with hand shaped Red Cedar toe rails, deck caps, thwarts and real cane seats. Final sanding, the a final varnish or polyurethane finish is applied. Lights are then installed. As our saying goes “It is just like the Real Thing! With the 96 you can get 4 energy efficient LED Flat panel lights which are now the standard option. 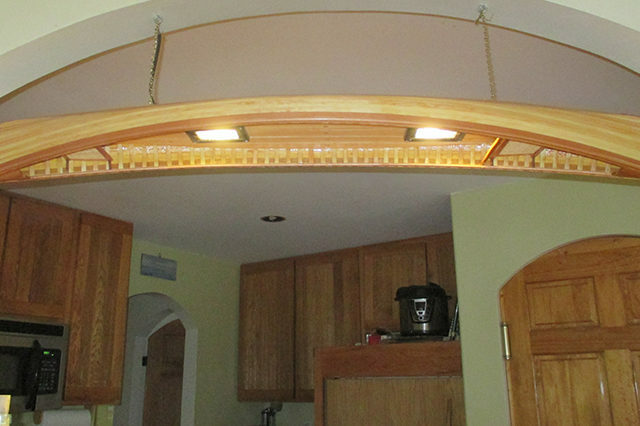 Or design or your own lights and we will install them. 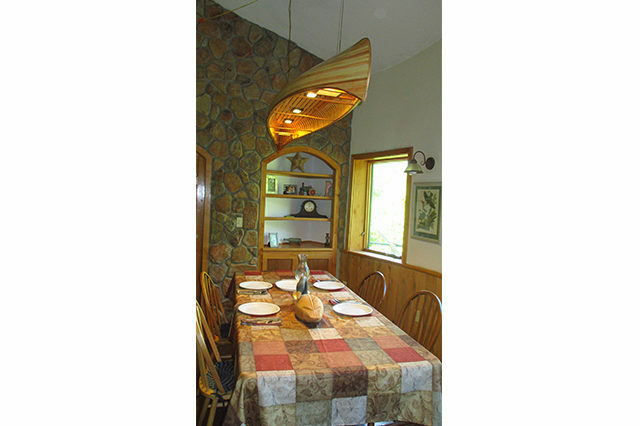 This large canoe light measures 94 to 95″ long, 18″ wide by about 10″ deep at the ends. It has two hanging points. Weighs 16 lbs. There are many options for hiding the cord, pull switches, remote dimmers, etc. If you would like to build your own and save a lot of money, we sell complete kits that any one with basic hand tools can build. It is actually no more difficult to build than any of the others, except it is larger, more finishing and you need the space to work on it. The kit is a great value and many have been built. 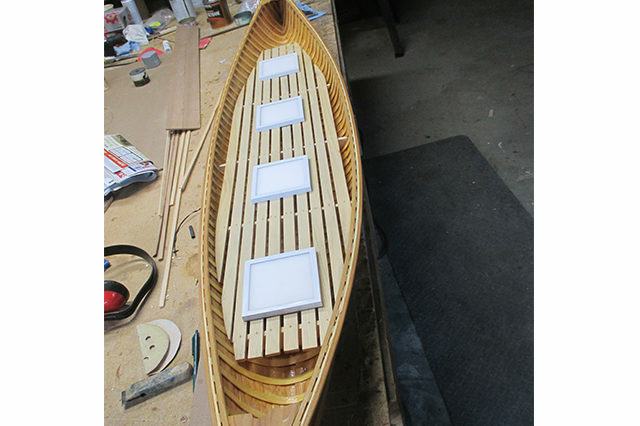 The lights and assembly can be bought as a kit to add to your own 54″ canoe or purchased with one of our kits. A great value either way. The finished chandeliers are painstakingly built with 50 hours for each one. For smaller areas we have the 72″ (quite large) which is built the same way as the 96 but shorter, at 70″ x 12″ x 6″, and has 4 lights. Then there is the 54″, a mid-size version, which has been extremely popular, especially to builders who have already completed the model as a kit. 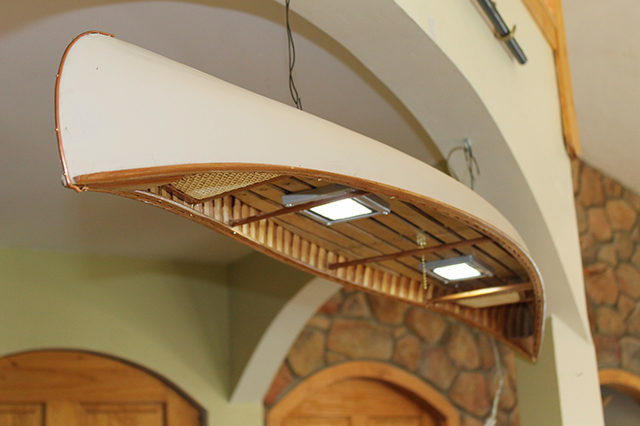 The finished ready to install 54 canoe fits into the smaller areas such as between doorways, snack bars or hung from a wall at the head board of your bed for the coolest of reading lights. Any place for the canoeing or paddling enthusiasist! 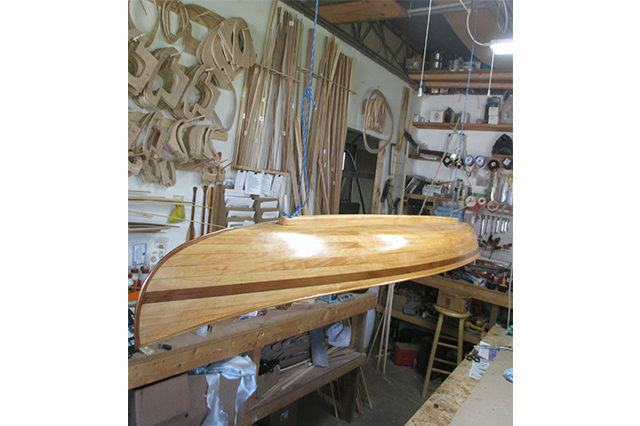 Ready to install complete 54″ Canoe Chandelier with 2 lights, pull switch, two hanging eyes and 6′ cord. $1075.00 + shp is about $70.00 USPS Priority to lower US. 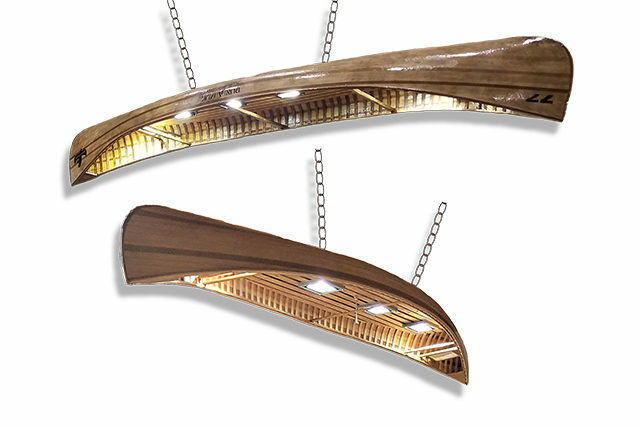 The complete kit to build this beautiful light as a package is available. You can save a lot if you build it yourself. 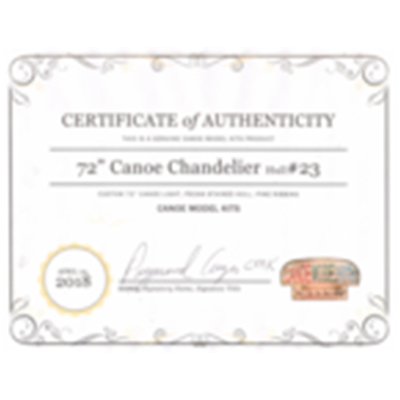 Every completed canoe or kayak now comes with a certificate and hull number. 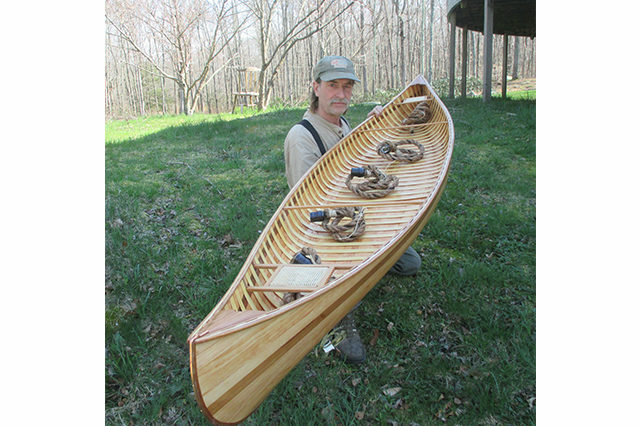 Registration for your own home built canoe from a kit is available. 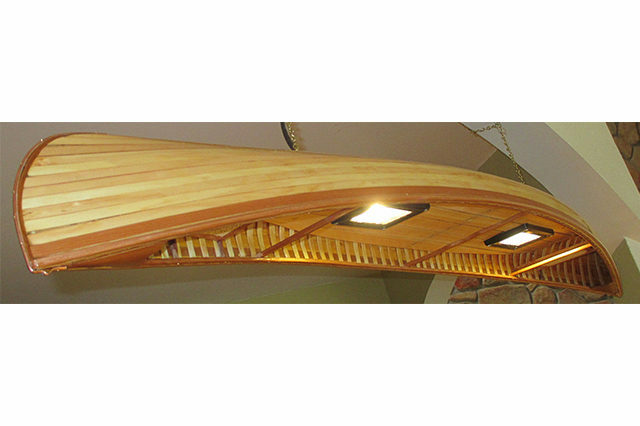 Ready to install 96″ Canoe Chandelier now with the premium LED Flat Panel lights that are dimmable and switchable between 3 shades of white are included. 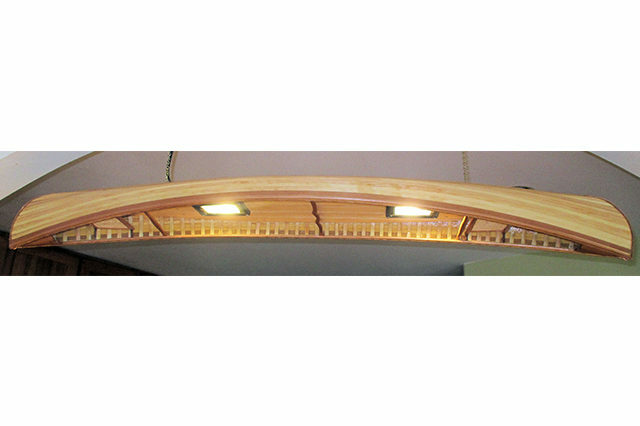 Four 4″ lights, round or square is standard, but 7″ LED Flat panels, up to 5 can be added. 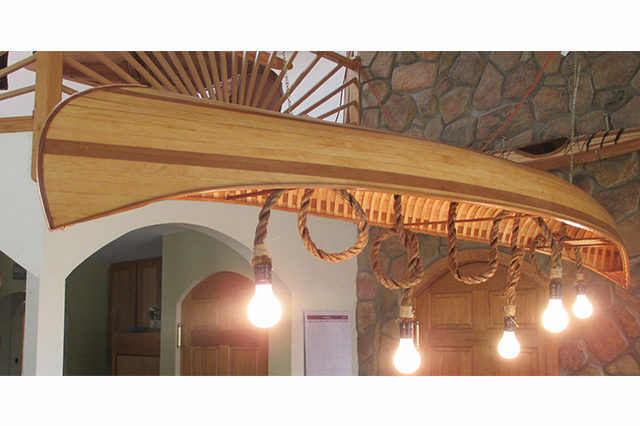 Two hanging eyes and 6′ cord (or any desired length). $1775.00. Custom designs welcomed. 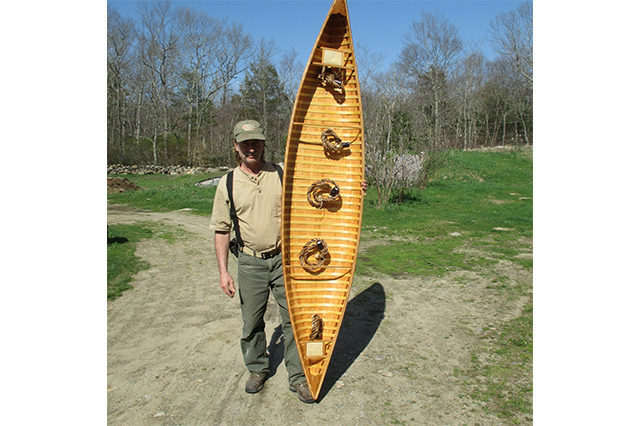 This is a real canoe. Built just like the full size. 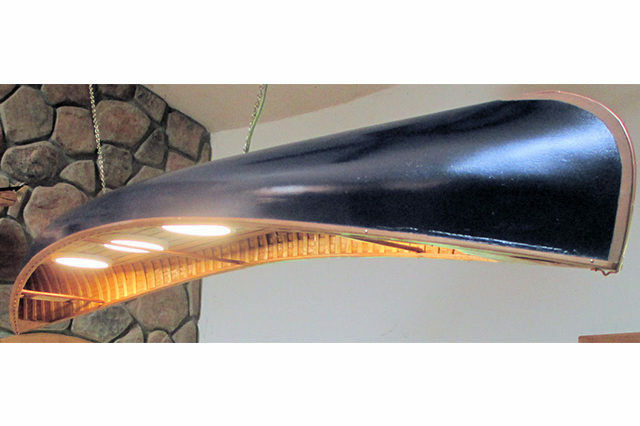 Strip construction with a layer of clear reinforcing epoxy fabric for a solid long lasting light. Certificate of Authenticity. Ships in very large 1/4″ plywood box, UPS Ground. US is $340, Alaska and Canada more. Call about shipping cost to your area. 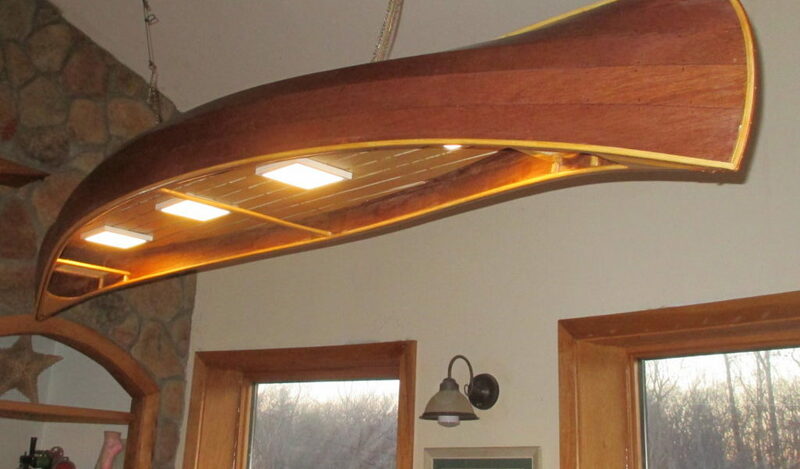 New ready to install 54″ canoe light. Beautiful red cedar finish parts with pine ribbing. What is so special about this one is that it has a life like canvas covering that has texture. it is painted off white. This is a real beauty, for sale now. $1075 + $75 shipping USPS. 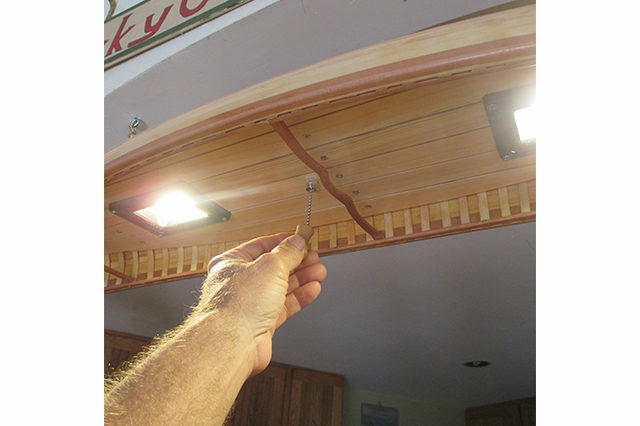 New ready to install 72″ canoe light. Beautiful red cedar finish parts with pine ribbing. 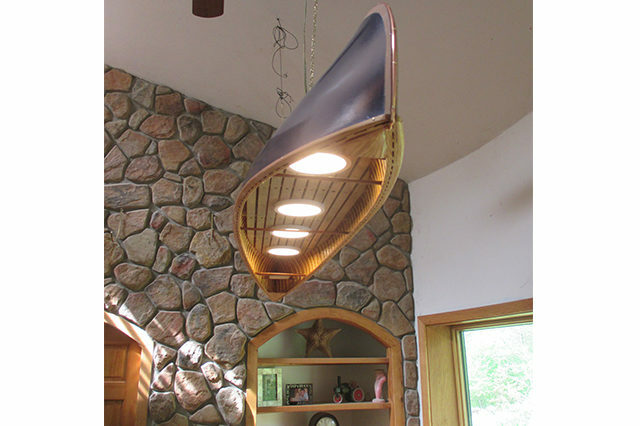 This gorgeous canoe chandelier has 4 square LED flat panel lights that can be soft, warm or sun light and dimmable, very energy effiecient. 1275 + $125 shipping USPS.